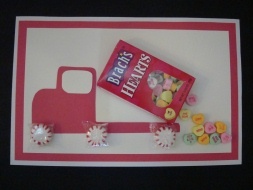 Try Unloading Some Love on Valentines Day by having the kids make this cute dump truck Valentine. Preschoolers will need help cutting the shapes, but they can do all the gluing! This is a great Valentine for boys or anyone you want to dump some love on! 1. From a piece of red paper cut out a truck shape (as shown in the picture). Cut a piece of white card stock big enough to fit your truck and a box of conversation hearts. 2. You will need to put two more layers of card stock underneath. Glue your white paper onto a piece of red card stock and cut around it. Repeat with another color (double sided mounting squares used for scrapbooking also work really well for sticking all the paper together). 3. Now it's time for the gluing your truck together. Glue on your paper truck and your box of conversation heart, tipping the box so it looks like it's unloading. We also cut out a square window from white paper. 4. Glue on three peppermint wheels onto your truck. Open up your second box of conversation hearts and glue a few on, falling out of the truck onto the ground (you can eat the left overs). 5. If you want you can write a special message on your Valentine. For a boy giving this to a girl you can write: "Unloading some Love for you on Valentine's Day!" For a boy giving to another boy you can write: "Unloading a Big Thanks for being such a good friend!" You need to use card stock paper, or heavy card board for this Valentine. Why? Because the conversation hearts and peppermints are heavy and will just flop around on one thin piece of construction paper, which will work, but won't look or travel very well.